It’s often hard to control kids in parking lots when unloading packages, rifling for keys, and tending to a baby takes precious attention away from children, leaving them vulnerable to a number of dangerous situations. That’s why a mother of two created Parking Pal. Parking Pal is a great aid in keeping children safer. Place the Parking Pal magnet on the side of the vehicle, where it will remain safely attached at all times. It was specifically designed with bright colors, playful illustrations, and a small palm children love to place their hands on. When getting out of or coming back to the vehicle kids go directly to the Parking Pal magnets and put their hands on it, fiddle around with it, and chat with each other while she gets her youngest into his stroller or back into his car seat. After a couple learning sessions, children will discover that the Parking Pal is their safe spot, and they will know where to go the second they are outside the car. It also helps teach them that parking lots are no place to play. 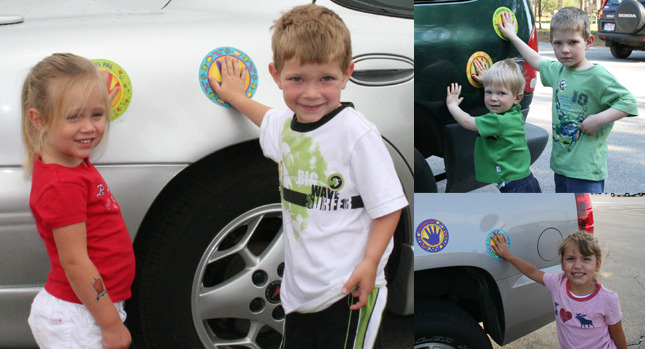 Other uses for the Parking Pal magnets include using it in public restrooms. Place the magnet on one of the metal doors so your toddler will not be touching yucky things while the mom or nanny is tending to another child. Another use we have heard of is people using the Parking Pal on the fridge for a time out.